Thursday, November 7th, was our official first day in Rishikesh. 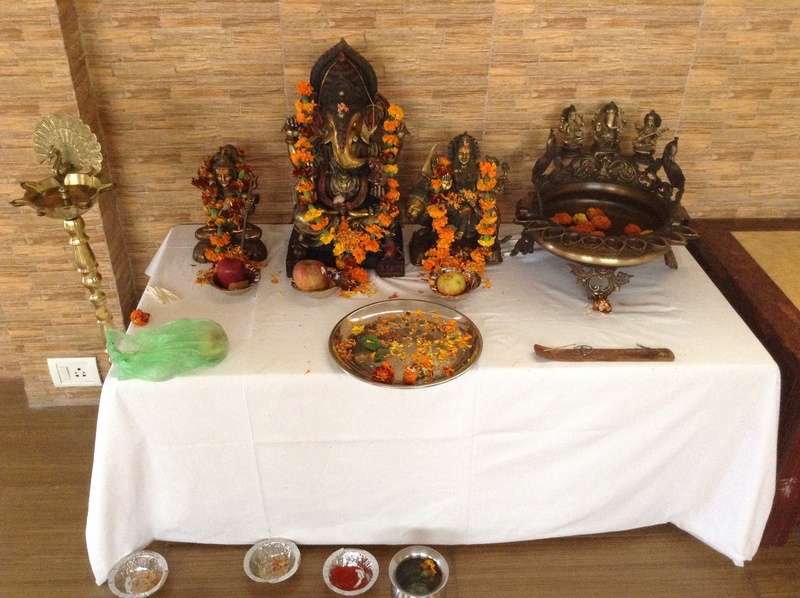 We kicked off the retreat with an afternoon puja ceremony to honor the Hindu deities, Durga, Ganesha and Shiva. From my previous knowledge, I know these sacred mythological beings are worshipped by the Hindu people and at times, honored by yoga practitioners as well. Lord Ganesha is the elephant god and he is said to be the remover of all obstacles. Durga embodies the fierce, fiery female energy and Shiva is the powerful masculine being and represents everything that resides in us all. The owners of Nirvana Hotel invited local priests to initiate a welcoming ceremony to help us set our intentions for the week. The chants to Shiva, Ganesha & Durga resounded throughout the room and we joined them in blessing the figures on the alter at the center of the space. The priests gifted each of us with handmade flower necklaces and they painted red bindis in the center of our foreheads. The hotel owner presented our retreat leader, Valerie, with this special poster welcoming us to Rishikesh. It was truly an honor and a blessing to be welcomed in this special way. Valerie is continuously surprised and humbled by their gifts and acknowledgment and I can see why. They are all so warm and welcoming and they hold space for all of us in such a profound and special way. 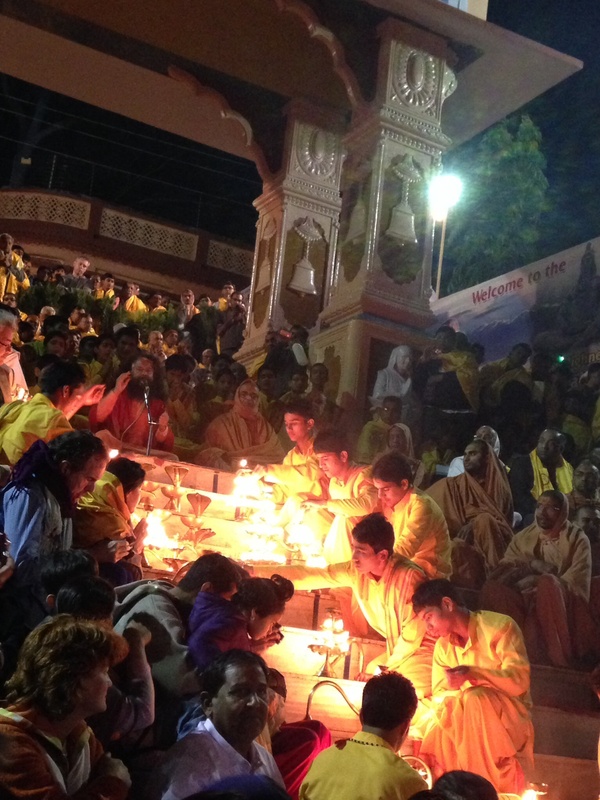 Last night, we attended the Ganga Aarti which is a daily ceremony to honor the Ganges river. In such an organized and respectful fashion, the entire town gathers to see Swami Chittananda and his disciplines as they chant, sing and pray to honor the river, The Mother Ganga. And the wild thing is, they do this every night!!! I cannot even begin to describe the love, devotion and solidarity of the people at this event. After singing their praises for Mother Ganga, they pass around gold candelabras with various candles lit and they pass them through the crowd with mindfulness and ease. A few young Indian girls who were seated behind us made sure we had a chance to touch them. At the close of the ceremony, every These traditions are truly remarkable and sacred that I feel so honored and thankful to be a part of them. Love is always within us. Love is always there. Once you love someone, you can never take the love back. Love is continuous. Love is not there to be given or received. It is always present. I mean I can’t make this stuff up. So inspiring and full of wisdom.